I don’t know about you but I’m already feeling the summer blues 🙁 With the passing of Labour Day and the arrival of cooler nights, it feels as though summer is over but what a fantastic summer it was! 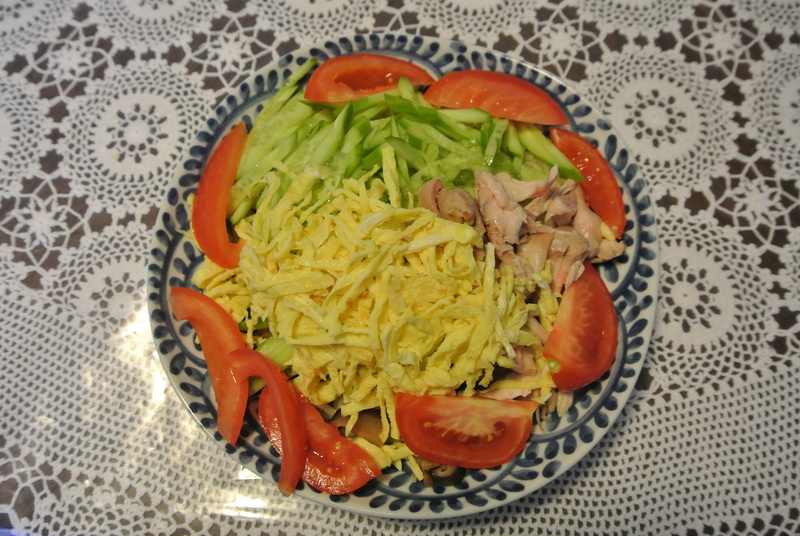 So, in honour of a great season, one of our family’s tradition is to eat Hiyashi Chuka. We only eat this dish in the summer and is my favourite ramen dish growing up! I remember spending my grade 8 and grade 9 summers in Japan with my grandparents and wherever I could, this would be the dish I would order (along with shaved ice of course!). Hiyashi Chuka literally means “cold noodle salad” and is made with ramen noodles topped with various ingredients and then dressed with a sesame vinaigrette. 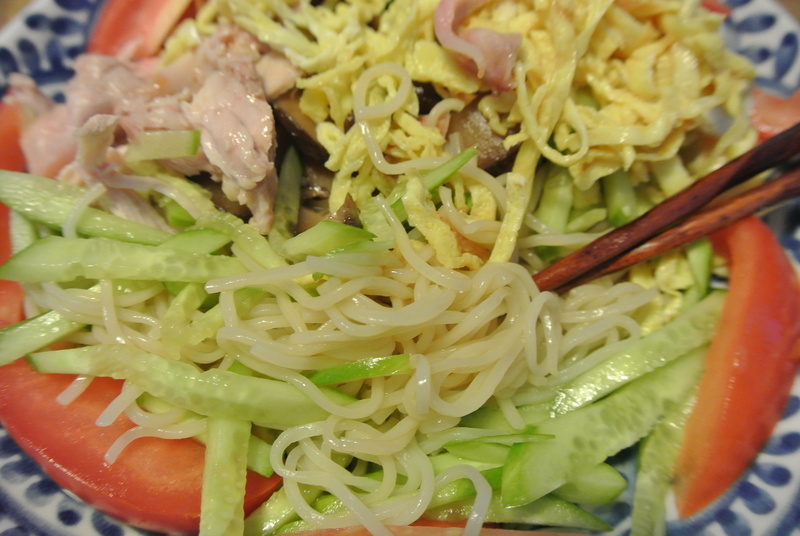 My mom tops her version with one meat (usually cut ham or shredded chicken), cucumber, cooked marinated shiitake, tomatoes and julienned tamago (sweetened egg). Sometimes when you buy the ramen, it comes with a pre-made sesame dressing otherwise my mom just makes her own – either way, its so refreshing on a hot summer night for dinner! Until next summer…. 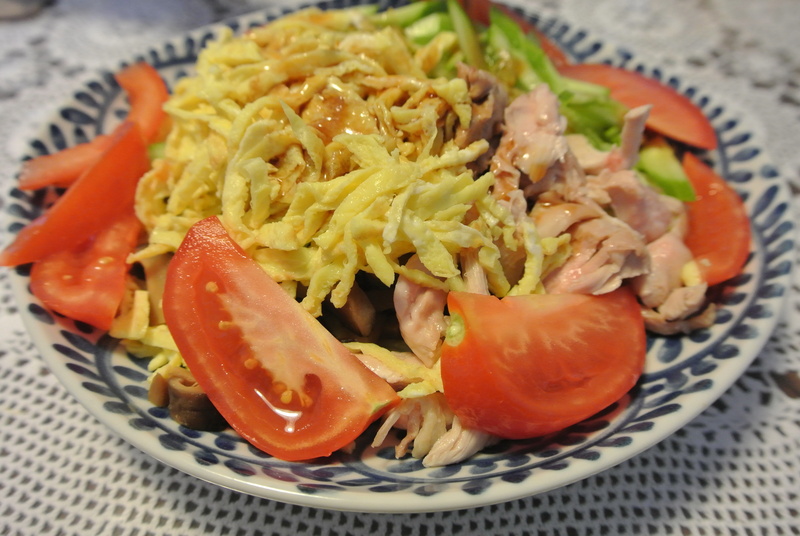 My mom’s hiyashi chuka! Delicious! Hiyashi Chuka – A close up of tamago, cucumber, chicken, tomatoes, marinated shiitake (Japanese mushrooms) and sesame vinaigrette.